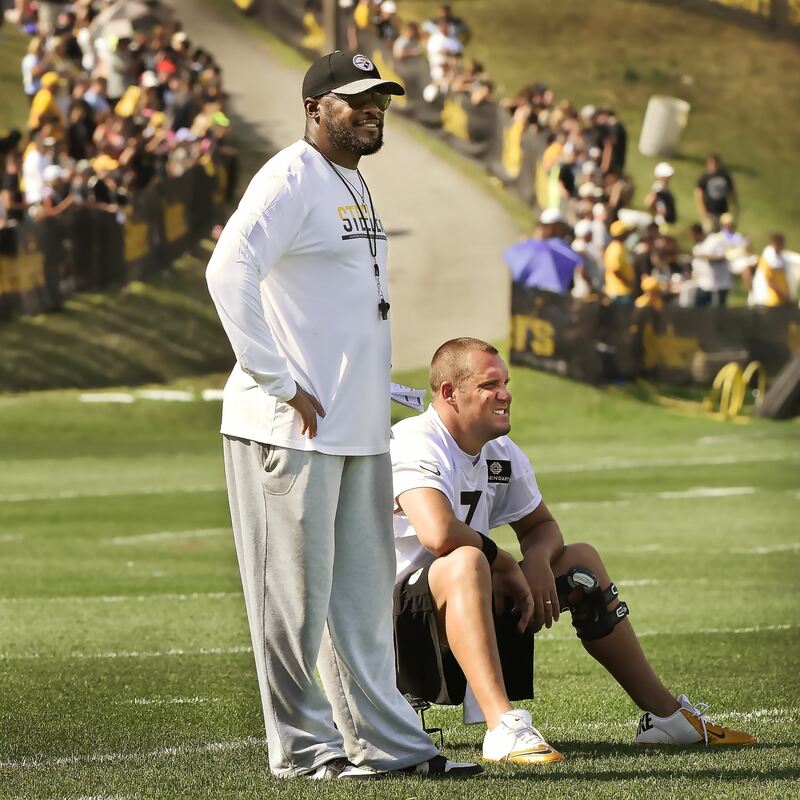 Should Ben Roethlisberger sit out preseason, ALL of Preseason? It’s certainly a new era in the NFL. For example, the Pittsburgh Steelers just ended their training camp at St. Vincents in Latrobe, Pennsylvania less than three weeks after the players reported on July 28. That’s a far cry from the yesteryear of Camp Noll, which included six weeks of two-day (and remember, Chuck Noll believed in full contact practices.) Also, it’s now generally understood that, not only will players of a certain stature (valuable superstars) not play very much in the preseason, in some cases, they’ll sit out entire games. Such was the case last year, when Steelers quarterback Ben Roethlisberger missed the first and last preseason games, while Landry Jones started in his place. Fast-forward to the 2016 preseason. Not only did Roethlisberger skip Pittsburgh’s first game against the Lions last Friday night at Heinz Field, he was joined on the sidelines by Antonio Brown, Le’Veon Bell, DeAngelo Williams and Maurkice Pouncey. If you thought things would be much different for the Steelers second preseason game, Thursday night at Heinz Field, you’re wrong. While Pouncey, who missed the entire 2015 regular season after suffering a leg injury in the third exhibition game, may see some preseason action against Philadelphia Eagles, the rest of the aforementioned valuable superstars will get a second week to observe and relax. He showed up in tremendous condition. He’s performed well. He’s obviously a veteran. What’s required for him to be ready to play might be different than others. My job is to give everybody what it is they need to be ready to go. I just believe that the reps are better served to be given to guys like Landry [Jones] and Dustin [Vaughan]. It is true that Mike Tomlin already knows what his star quarterback is capable of, but let’s not kid ourselves. He also knows what his offense isn’t capable of when Ben Roethlisberger is out of the lineup, as evidenced by the struggles the unit endured–specifically the passing game–when he missed four games in 2015 with a sprained MCL. As for the rest of the players on the list, of course everyone knows what Brown, Bell and Williams are capable of and, more importantly, how vital their health is to the success of the offense. I’m of the opinion that players like Ben Roethlisberger and Antonio Brown would be best-served to sit out the entire preseason. If we’re to assume one of the reasons Tomlin has rested his offensive stars thus far is to avoid a serious injury, well, those can happen at any time in these games that don’t count. Do you honestly think it will affect Roethlisberger’s or Brown’s regular season sharpness one bit by not taking reps in the preseason? Minnestoa Vikings star running back Adrian Peterson has famously not had a carry in the preseason since 2011, yet he’s remained at the top of his profession year-in and year-out. Does the absence of so many superstars make preseason games a little tougher to sit through? Yes, but the absence of even one or two vital players–particularly a franchise quarterback–often makes regular season games that much tougher to win. This entry was posted in Steelers 2016 preseason, Steelers 2016 training camp, Uncategorized and tagged Antonio Brown, Ben Roethlisberger, Chuck Noll, DeAngelo Williams, Landry Jones, Le'Veon Bell, Maurkice Pouncey, Mike Tomlin, Pittsburgh Steelers. Bookmark the permalink.